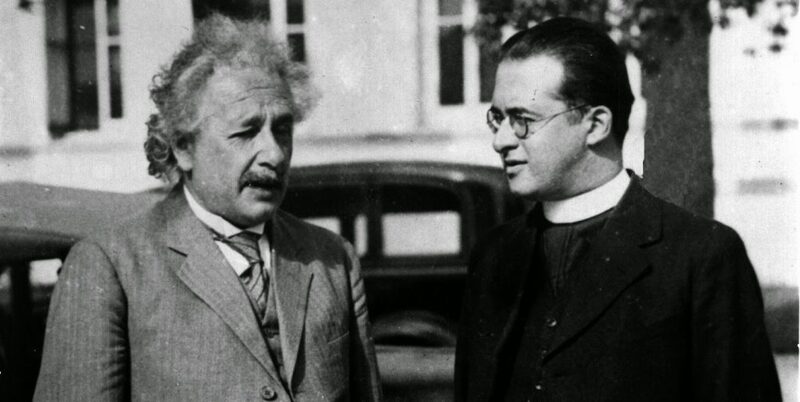 On this day 120 years ago, Georges Lemaître, ‘father’ of the Big Bang was born in Belgium. First soldier, then priest and astrophysicist, Lemaitre reached the heights by proclaiming something that broke all the established rules: the universe was expanding and was born out of the explosion of a tiny point, which he called the “primeval atom”. At that time most physicists thought that the universe was static and eternal, a comfortable idea that avoided thorny questions about its origin and creation. Lemaître’s ideas were rejected in part because they were consistent with a universe created by God at the beginning of time. Lemaître fought throughout his career for this creationist view and went so far as to reach the Pope over it. His fellow scientists would not call a truce either over the religious and scientific implications of his theory. Albert Einstein himself, after hearing his proposal, snapped: “Your calculations are correct, but your physics is abominable.” But soon after, the field of physics would suffer a cataclysm that would eventually tip the scales in favor of the astronomer priest. When World War I broke out, Lemaître was studying civil engineering. The young man put his studies on hold, enlisted and served as an artillery officer at the front, where he witnessed the first attacks with toxic gases. After the war ended, he made two decisions that would mark the rest of his life. First, he left engineering for mathematics and physics. Second, he decided to prepare for the priesthood. One of his first references was another astronomer with strong religious beliefs: Arthur Eddington. A few years before meeting Lemaitre, Eddington had been about to end up in a prison camp for refusing to fight in the First World War. His Quaker beliefs prevented it. Eddington ended up being freed and, in 1919, led an expedition to the island of Principe in West Africa. There, during an eclipse, he took pictures proving that the Sun bends space and time around it deflecting the light rays coming from other stars. It was one of the first experimental confirmations of Einstein’s theory of relativity. Eddington would become the greatest popularizer of relativity in the UK and the new ideas in astrophysics and cosmology that this entailed. Beside him, at the University of Cambridge, Lemaître began studying cosmology, stellar physics and numerical analysis in 1923. Later he returned to his country, found a place at the Catholic University of Leuven and continued to investigate new implications of relativity in the known universe. In 1927, at age 32, Lemaître published the first study in which he proposed that the universe was expanding and provided the first estimate of its speed. His study, in French, went unnoticed. The few physicists who came to hear his theory rejected it outright, as they saw it unacceptable. The idea of ​​a stable universe, without a beginning, was so widespread that even Einstein had included in his theory of general relativity a “cosmological constant” that functioned as a negative force of gravity. Its function was to prevent the universe collapsing back on itself being under the pressure of the force of gravity. The result of this hack was a stable, static universe. Without this constant, nature showed Lemaître to be right, and Eddington was convinced of this when his former student turned up looking for him. The priest published an English version of his study, with the help of Eddington, in 1931 and continued to develop his idea that the universe came from a tiny point, a “primeval atom” or a “cosmic egg” that exploded at the time of the “creation” of the universe. Putting aside the terms used, the idea is totally valid more than 80 years later. Lemaître probably never would have convinced Einstein and the rest of the scientific community if, in 1929, the American Edwin Hubble had not released new data showing that some galaxies were moving away from the Earth due to the expansion of the universe. Soon after, in 1933, Einstein himself admitted that he was wrong and embraced the proposals of Lemaître. “This is the most beautiful and satisfactory explanation of the creation of the universe I’ve heard,” the German physicist is said to have remarked in 1933, after a chat with the priest. Lemaître became a star. The newspapers spoke of the triumph of his theory to explain the origin of the universe and the priest traveled to U.S. universities giving lectures on his findings accompanied by Einstein. In 1949, in a series of radio talks for the BBC, the astronomer Fred Hoyle was the first to coin the term Big Bang to refer derisively to the proposals of Lemaître and Hubble. The term stuck and two decades later it became common in the scientific literature. Even today it is not known why the English version of Lemaître’s study did not include the part where he calculated the rate of expansion of the universe. This eventually led to the Hubble constant being named in honor of American astronomer who proposed it two years after Lemaître.